Phenolic casters are designed for heavy load ratings. They are made of phenol-formaldahyde (phenolic) resin which makes them highly resistant to a number of industrial hazards, such as grease, oil, mild acids, and most chemicals. Phenolic casters are extremely hard, and can withstand extreme temperatures (as low as -40°F and as high as 475°F, in some cases). They can be used for storage of standing loads without flattening or permanent set. Generally, phenolic casters are impact resistant, non-marking, and floor protective. DH Casters International is a leading manufacturer and supplier of a full line of casters and wheels. 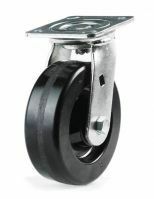 They stock phenolic casters in a range of sizes from 4″ to 12″.